Delicious Scraps: Free (Retired) Scrap Kit "Cherries On Ice"
Free (Retired) Scrap Kit "Cherries On Ice"
I am cleaning out my shop and blog big time. If there is a kit that used to be there and now is gone - I most likely deleted it- and you would like it just email me and I might still have it. Here is the old mini kit that is now free and the freebie that started it all. Hi there Delicious Scraps! I just realized, I've been downloading stuff from you forever, mostly freebie stuff, from my Google Reader, and really never take the time to pop over and say thanks - so please, consider this about 200 "thank yous" from knittinjen! You have some really fun and neat stuff - this cherries on ice - i actually clicked on it thinking I'd buy it if it were super cheap cuz I just LOVE the colors, and it was free!! So REALLY thanks!! (like 200 more times). That's all, have a lovely weekend! So that's where it all started from !! Bravo and merci BEAUCOUP !! Lovely kit ! Thanks so much ! I have always loved a grey tone with pink. Thank you for sharing! Thank you so much for this post. 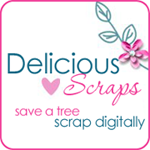 I want to let you know that I posted a link to your blog in CBH Digital Scrapbooking Freebies, under the Page 2 post on May. 21, 2010. Thanks again. So crisp (and delicious!) Thanks for bringing this back and sharing it. You are incredibly talented! thank you so much for the sweet kit. Thank you so much for the freebies. If my paypal acct were not on the blitz, I'd be cleaning out your store! This is so pretty! Thank you for sharing your time and talent. Que bello, muchisimas gracias ! Thank you for the great kit. Love the colors!